TO INTERACT AND DISCUSS PROJECTS AND LECTURES. Warren:I finally get what you are talking about when you use the frame on a piece of art as an example. 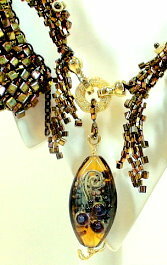 Looking at your wonderful work I notice you seem to have the correct balance of art and frame in all your beadwork. Another thing is your color work. You seem to use the less is better notion. When I study the beautiful beadwork/art in foreigh countries they seem to follow the less is better approach as well. Do you make an effort to use the colors you do or does it just happen? My choice of colors is mostly deliberate, with some trial and error experimentation.